Mr. Prigozhin’s critics — including opposition politicians, journalists and activists, the United States Treasury and now the special counsel, Robert S. Mueller III — say he has emerged as Mr. Putin’s go-to oligarch for that and a variety of sensitive and often-unsavory missions, like recruiting contract soldiers to fight in Ukraine and Syria. “He is not afraid of dirty tasks,” said Lyubov Sobol of the Anti-Corruption Foundation, an organization established by the prominent opposition leader Aleksei A. Navalny to investigate abuse of state contracts and other illicit schemes. The United States imposed sanctions against Mr. Prigozhin in December 2016, followed by his two main, publicly acknowledged companies, Concord Management and Consulting, and Concord Catering. In doing so, the Treasury Department said he provided extensive support to senior Russian Federation officials, including constructing a military base near Ukraine that was used to deploy Russian troops. The United States imposed sanctions against Mr. Prigozhin in December 2016, and then against two of his companies: Concord Management and Consulting and Concord Catering. The most notorious venture linked to Mr. Prigozhin, however, is the troll farm that is accused of attacking opposition figures in Russia and seeking to magnify and aggravate social and political divisions in the West. Despite his frequent denials of any involvement, his critics say he and others like him provide a way for the Kremlin to engage in such activities while maintaining a discreet distance. 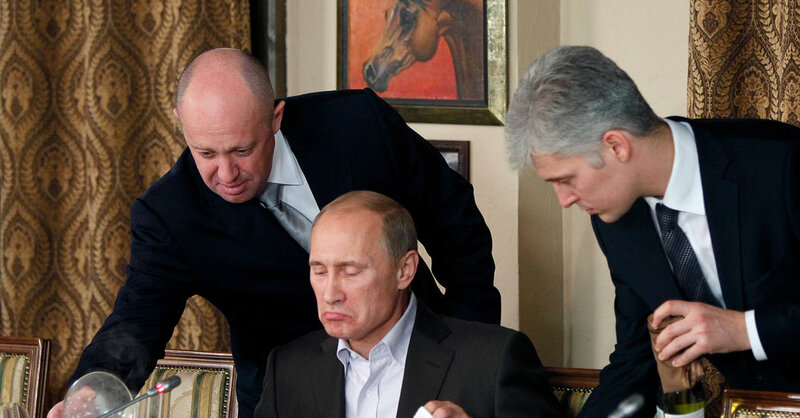 The indictment on Friday says, among other charges, that Mr. Prigozhin frequently met in 2015 and 2016 with Mikhail I. Bystrov, the top official in the troll factory, which ran a disinformation campaign called Project Lakhta that by September 2016 had a monthly budget of $1.2 million. Boris L. Vishnevsky, an opposition member of the city council in St. Petersburg, who has called for an official investigation into threats by Mr. Prigozhin against journalists, said the Kremlin endorsed projects like the troll farm without directly organizing them. When the troll factory was formed in 2013, its basic task was to flood social media with articles and comments that painted Russia under Mr. Putin as stable and comfortable compared to the chaotic, morally corrupt West. The trolls soon branched into overseas operations focused on Russian adversaries like Ukraine and the United States. Facebook, Twitter and Google have all identified the Internet Research Agency as a prime source of provocative posts on divisive American issues, including race, religion, gun laws and gay rights, particularly during the 2016 presidential election. Facebook found, for example, that the agency had posted 80,000 pieces of content that reached more than 126 million Americans. Last month, Twitter announced it had started emailing more than 677,000 people in the United States who interacted with accounts from the agency during the election. Mr. Prigozhin said he was too busy to be interviewed for this article; in fact, he has given just two extended interviews in the past decade. He issued a denial of the accusations of meddling in the 2016 election, however, after a recent investigation published by the Russian newsmagazine RBC. “Neither Concord Company nor other structures owned by the businessman are in any way connected with the activities directed toward meddling in the U.S. election,” RBC quoted one of Mr. Prigozhin’s representatives as saying. Dmitri S. Peskov, Mr. Putin’s spokesman, also denied any Kremlin connection to the Internet Research Agency. By NATALIA V. OSIPOVA and AARON BYRD on Publish Date October 31, 2017. Photo by Aaron Byrd/The New York Times. Despite Mr. Prigozhin’s veil of secrecy, limited details about his personal life have emerged, mostly through the Instagram accounts of his two grown children. One picture featured his son, Pavel, walking naked on the deck of the 115-foot family yacht. Other pictures showed a private jet and a vintage powder blue Lincoln Continental, said to be Mr. Prigozhin’s favorite car. His daughter Polina posted a picture of the sweeping view from his wooded compound in Gelendzhik, the resort town on the Black Sea. The compound, including a pier for the yacht, was built in an ostensibly protected forest much beloved by Mr. Putin and his cronies, according to the Anti-Corruption Foundation. The day after researchers from the foundation leafed through the Instagram accounts and took multiple screen shots, the accounts went private. The foundation launched a drone over the sprawling family compound outside St. Petersburg to photograph what it said were father-daughter mansions and various amenities, including a full basketball court and a helicopter pad. Delovoy Peterburg, an independent daily newspaper published in St. Petersburg, listed him last year as ranking 83rd among the city’s 304 ruble billionaires, with 11 billion rubles, or almost $200 million. The newspaper included only property in the public record, said Irina Pankratova, an investigative reporter. If all property linked to him had been counted, she said, he would rank in the Top 5. Born in 1961 in what was then Leningrad, now St. Petersburg, Mr. Prigozhin showed adolescent promise as a champion cross-country skier that was cut short in 1981 by a prison sentence for robbery and other crimes, according to an extensive biography compiled by Meduza, an online investigative publication. When he got out after nine years, he started the hot-dog business, which led to his running a chain of convenience stores and eventually to starting several deluxe if kitschy restaurants in St. Petersburg. His patrons “wanted to see something new in their lives and were tired of just eating cutlets with vodka,” Mr. Prigozhin told a magazine called Elite Society. An old rust bucket that he and his soon-to-be-jettisoned partners converted to the floating New Island Restaurant became St. Petersburg’s most fashionable dining spot. Eventually, Mr. Putin himself showed up, towing world leaders. He hosted President Jacques Chirac of France and his wife in 2001 and President George W. Bush in 2002. President Putin celebrated his own birthday there in 2003. During these glittering occasions, Mr. Prigozhin made sure to hover nearby, sometimes even clearing empty plates. The first significant state contracts began flowing in after Mr. Prigozhin founded Concord Catering. Starting with the St. Petersburg schools, he moved on to feeding the far more numerous Moscow schools and, finally, most of the Russian military. His trademark became lavish state banquets, including inauguration feasts for both recent presidents, Dmitri A. Medvedev and Mr. Putin. In just the past five years, Mr. Prigozhin has received government contracts worth $3.1 billion, the Anti-Corruption Foundation reported. Lately, he has branched out into areas like recruiting contract soldiers to fight overseas and establishing a popular online news service that pushes a nationalist viewpoint, making him even more indispensable to Mr. Putin. A leading news website in St. Petersburg, Fontanka, which has reported extensively on Mr. Prigozhin’s military contracts, recently discovered another potential source of revenue, perhaps the biggest yet. In exchange for providing soldiers to protect Syria’s oil fields, companies linked to Mr. Prigozhin were awarded a percentage of the oil revenue, the website reported. Some Russian contract soldiers in Syria were back in the news this month after a Feb. 7 clash between Kurdish forces, backed by the United States, and Syrian government forces aided by Russian mercenaries. Reports about exactly what happened remain murky, but anywhere from five to 200 Russian soldiers have been reported killed. The Russian Foreign Ministry on Thursday confirmed five deaths, but has refused to confirm that it has contract soldiers fighting in Syria, fueling anger among the families of those fighting about the lack of information. It has always been difficult to find his fingerprints directly on any of these shadowy firms, said Denis Korotkov, a reporter for Fontanka. The only clues are the companies’ overlapping ties, including the same managers, shared telephone numbers or IP addresses. After studying this material, Fontanka and the Anti-Corruption Foundation concluded in 2016 that significant government contracts were going to clusters of fake companies designed to circumvent federal rules on competitive bidding. State regulators also reviewed eight Defense Ministry contracts won by businesses linked to Mr. Prigozhin and issued a stern rebuke in May 2017. Russian law mandates that any contract go to the lowest bidder, but the winning tenders were only a fraction lower than the rest. Otherwise the bids were virtually identical, the Anti-Monopoly Service said, calling the 2015 bids fixed. The government announced that it would not press charges. Nobody anticipates Mr. Prigozhin appearing in a Russian court any time soon. “We don’t expect him to be punished given that he is among the president’s closest friends,” said Maksim L. Reznik, another St. Petersburg legislator demanding that he be investigated.